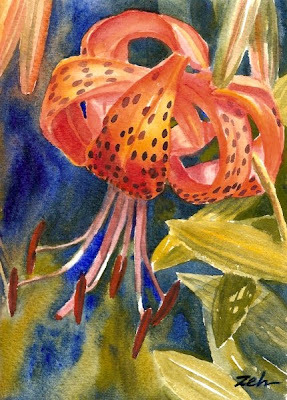 Tiger lilies carry some nostalgia for me as they bloomed in the yard where I lived as a child. They are among my favorite lilies. Like in all my autumn watercolor scenes, only three colors were used in this piece - a red, a yellow and a blue. No more are needed. I love the color effects that can be made by letting these three colors run together on the watercolor paper. Even though this isn't an autumn scene, the same technique and colors work very well with tiger lilies.